Introduction : Is this Book for You? These lessons are created for people who already know how to read Arabic with vowel markings – but can’t understand it, and will allow you to understand Arabic within 2 weeks (if you’re a really good memorizer), or a month (if you’re a slower memorizer) inshaa’ Allah. However you will continuously have to refer to these tables for revision for maximum benefit. Also note, you may find the order of the lessons abit strange (i.e. see the Contents page – I have made the 3 letter Patterns lesson earlier than 1 letter words lesson), but that is done to make it easier for you to digest the language. Arabic is made up of; 1 Letter words, 2 Letter words, 3 letter words, and sometimes 4 letter words. I will work gradually in presenting 1 Table per lesson, you have to memorize the table as much as you can. I will then briefly give an explanation of that Table. Then we move onto the next lesson. I will then give a practise Test after a few lessons. 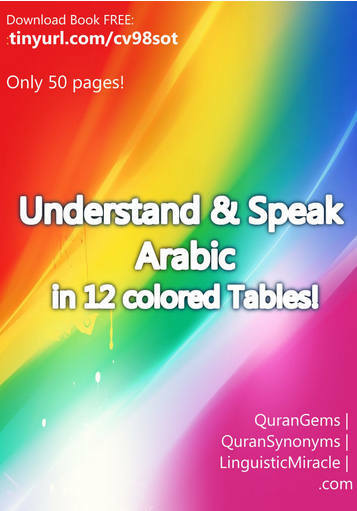 Once you have memorized the tables altogether, you will have got a strong feel of how Arabiclanguage works. This will make it extremely easy for you to understand the language when reading and hearing; Qur’an, Sunnah, or an Arabic speech etc. You have to make du’a (prayer) to Allah if you really want to learn Arabic, and Allah will help you. It worked for me, alhamdulillah!